Thundercat takes you on a high speed adventure to Whitehaven Beach and beyond! Stable catamaran that makes it feel like you're flying! Great for groups with up to 32 passengers! Thundercat is hard to miss as she cuts through the water. Her bright red colour combined with her impressive speeds will have you glad you're on board, enjoying the ride! With two 300 horsepower engines, Thundercat was not only built for speed, but also for stability and comfort. 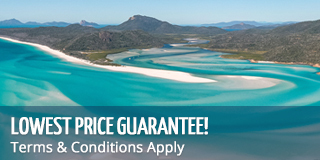 Taking passengers to the hotspots of the Whitsundays, this popular trip is ideal for those who are looking for an all-inclusive day trip with plenty of snorkelling, a stop at Hill Inlet Lookout and Whitehaven Beach and more. This unique and spacious vessel has patented technology to ensure stability, an onboard toilet and a friendly, energetic crew. 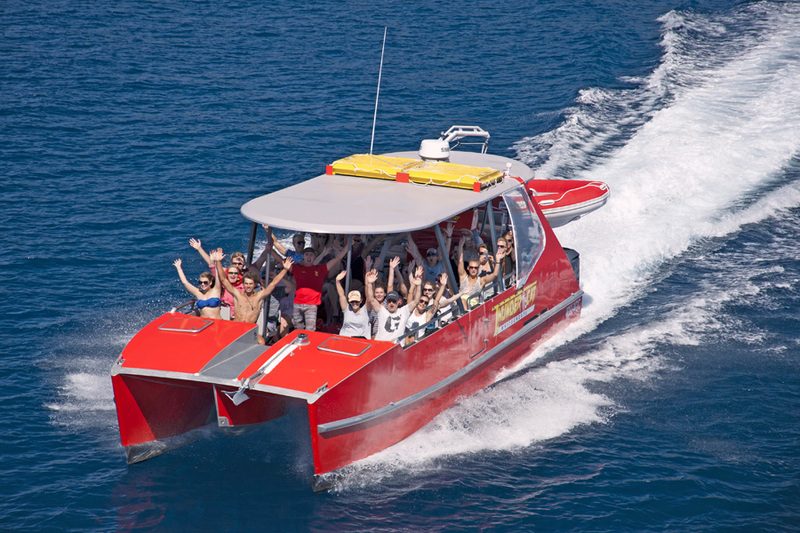 Thundercat is a great option for travellers who are worried about getting sea sick and for those who want an exciting day in the Whitsundays. If you are short on time but still want to experience the most of the Whitsundays, Thundercat 1 Day Tour is your answer - book your spot now. You will meet at Abell Point Marina at around 8:30am to get ready for an exciting day on the Whitsunday waters! You'll take no time getting to your first destination, where you'll get to explore, relax and have fun on the sandy white beaches of Whitehaven. Take a quick bushwalk up to Hill Inlet Lookout to see the famous swirling sands for yourself, before heading back on board for a delicious buffet lunch. Next you will head to Mantaray Bay and Langford Reef to snorkel at two of the Whitsundays best reefs, where you'll get to see the amazing marine life of the Great Barrier Reef. Keep an eye out for friendly green sea turtles, humphead Maori Wrasse or funny clownfish - the fringing reefs have it all! After snorkelling, you'll join the crew back on board Thundercat for one last ride back to Abell Point Marina, enjoying the view and the awesome ocean breeze on the way. After an action-packed day on the water, Thundercat offers all passengers the opportunity to join them for food, drinks and socialising at Base Backpackers. The courtesy transfer bus will pick the passengers up from their local accommodation and take them to Abell Point Marina. The bus will do pick up from Abell Point Marina roundabout, back to accommodation. Cancellations made less than 24 hours prior to departure will result in 100% cancellation fee. A minimum of 24hours is required to change tour departure dates. A transfer fee of $20 applies. All client cancellations forfeit 25% of total ticket price and all client cancellations made less than 21 days prior to departure will result in complete forfeiture of the full price. If the company has to cancel the trip (prior to the boats departure) and we cannot offer a suitable alternative, then a refund will be given minus card fees. We strongly recommend that you have travel insurance, especially during the wet season.